Transformational piano composition to help provide comfort for end of life patients. Many people feel fear or anxiety as they approach death for fear of the unknown. This special music for death and dying can be used in hospice care, palliative care and for the lay person. Sound Feelings dying music helps provide death support in a non-verbal way. This end of life care using special death music is a complement to the dying process. Music for Transition is a downloadable .mp3 or FLAC intended as an adjunctive, supportive entrainment music for stress release tool. This music first reflects the current stress or turmoil of the person near death and transforms this anxiety into a feeling of peace and tranquility. See also hospice music, death comfort and death music, music for hospice. Listen to a Sound Sample. Please be prepared for the “entrainment” transitional effect of this special music. 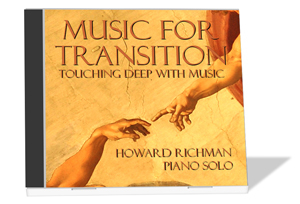 See the Uses and Applications for Music for Transition. Listening Suggestions for Music for Transition. Available INSTANTLY. After you make your payment, you will be given a password which will allow you to download the .mp3 or FLAC version of Music for Transition. You will then be able to hear the complete track on your computer. If you prefer, you may use your CD burner on your computer to burn a CD of the track, which you then will be able to play on any CD player.